As Nevada Wildfire Awareness Month winds down, we are able to take a breath and look at the fruits of our labor! Continue reading to learn about all of the awesome things that have occurred during May around Nevada. Michael Beaudoin, coordinator of The Network, toured the state as a part of the Nevada Interagency Wildfire Prevention team. The team was composed of Michael and staff from the Humboldt-Toiyabe National Forest and the Bureau of Land Management (BLM) - Elko and Las Vegas Field Offices. The team’s purpose was to distribute wildfire safety/prevention materials and provide outreach to the Nevada Department of Wildlife, Nevada Department of Transportation and Nevada State Parks throughout all 17 Nevada counties. This year’s prevention team educational materials focused on target shooting wildfire safety and fire prevention on public lands. 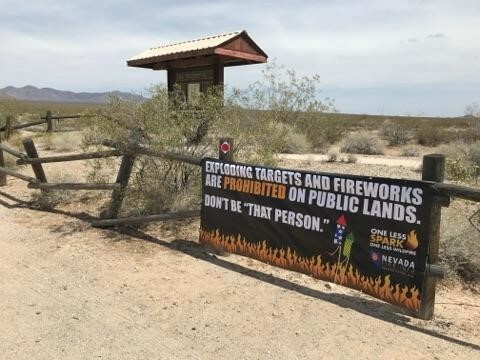 Target shooting on public lands is popular in Nevada and can cause fires under specific conditions. Bullet fragments from target shooting can reach 1400 o F and fine fuels, like cheatgrass, ignite at 660 o F . Target shooters should carry water, a shovel and a fire extinguisher with them and should never shoot on hot dry and windy days. ﻿The Interagency Wildfire Prevention team began the tour in Las Vegas on May 17 and provided outreach to many communities throughout Nevada. Major communities that the team focused on included Las Vegas, Pioche, Ely, Winnemucca, Elko, Reno and Carson City. 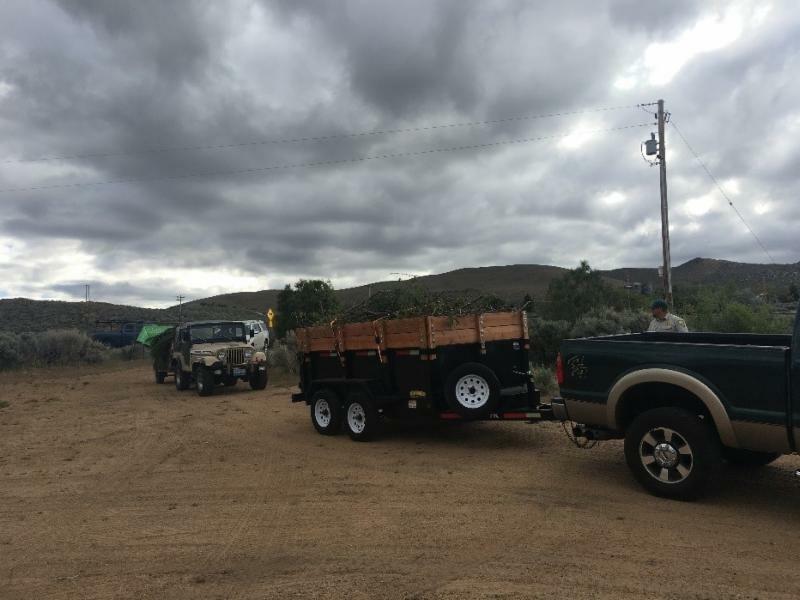 Michael provided an update on the status of The Network to the White Pine County Board of Commissioners and was featured on several radio programs alongside Clint Mothershead of BLM-Elko, and Jennifer Diamond of the Humboldt-Toiyabe National Forest. Michael used his experience from the prevention team tour to formalize key partnerships for the Network and gain insights on wildfire prevention public outreach in Nevada from Mothershead and Diamond that he will bring back to his role as Network Coordinator. The prevention team visited 434 locations, had 1,408 contacts, disseminated 16,851 fire prevention items, distributed 170 banners and gave nine radio and television interviews. The prevention team concluded its statewide tour on June 1 in Carson City. 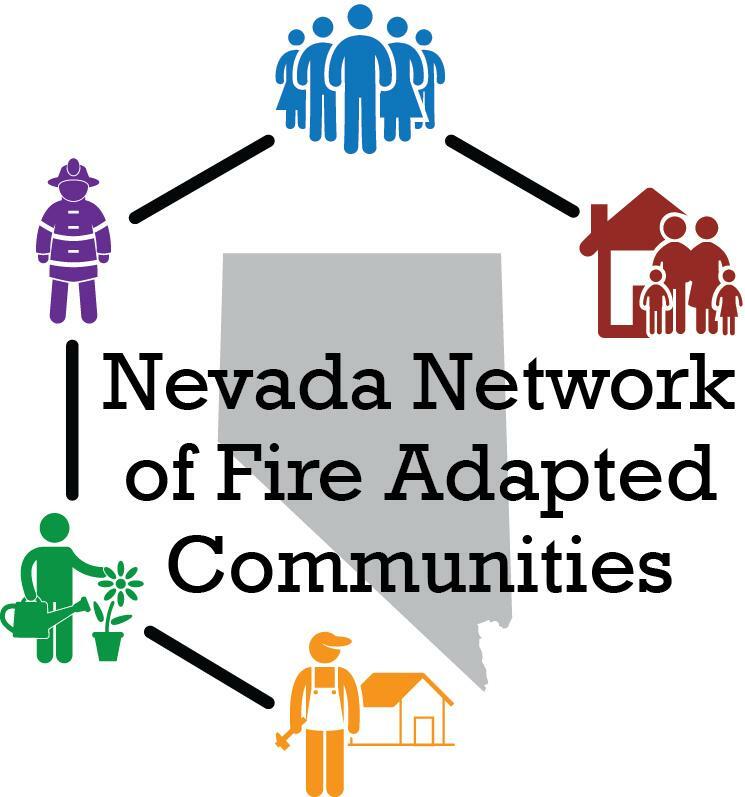 The Network, East Fork Fire Protection District, several local residents, and the Nevada Division of Forestry (NDF) met earlier this month to discuss the process and objectives of participating in the Nevada Network of Fire Adapted Communities Program. While still in the beginning stages, the fire protection district, NDF, and residents from local communities established some immediate objectives. The Network will work collaboratively with the fire protection district by providing some assistance with the district’s Community Wildfire Protection Plan (CWPP), drafting a defensible space inspection tool, and cultivating more Fire Adapted Community (FAC) community leaders. We hope to draw more community members into the process to assist in making communities safer. The District is considering establishing five to six geographic areas that have similar threats and hazards and are seeking community representatives from those areas. Residents from Holbrook Highlands, Job’s Peak Ranch, Sheridan Acres, and Jacks Valley participated in the initial meeting and The Network is looking forward to inviting more Douglas County community representatives to future meetings. The East Fork FAC group hopes to be able to apply for grant funds to develop the CWPP’s and also to fund on-the-ground fuels-management work. The Tahoe Douglas Fire Protection District has done some exceptional work in their jurisdiction in the Tahoe Basin under similar programs. Developing strong relationships with the Bureau of Land Management and U.S. Forest Service is essential to the group’s success, noted District Chief Tod Carlini. 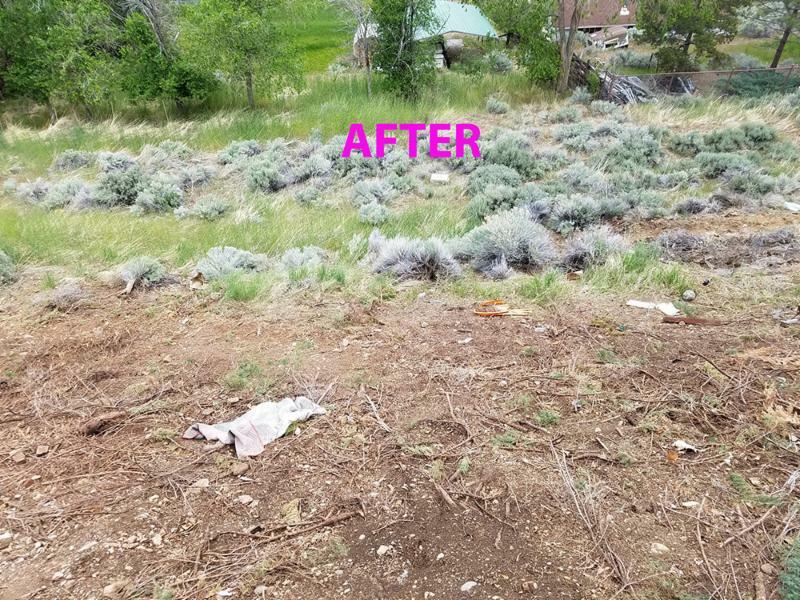 “We currently enjoy very positive relationships with both agencies and have been able to implement effective projects over the years, all with grant funds.” East Fork Fire Deputy Fire Chief and Fire Marshal Steve Eisele, managed one of the most successful fuel reduction programs called Compost Your Combustibles. The Network looks forward to assisting the East Fork Fire Protection District to achieve critical initial steps in pursuit of CWPP updates, defensible space inspection programming, cultivating community resident involvement, and providing evacuation planning assistance. 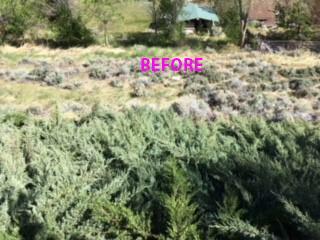 A picture of ornamental junipers before crews removed the hazardous fuels. Photograph courtesy of Sue Markert. A picture after the junipers were removed. Photograph courtesy of University of Nevada Cooperative Extension. of firefighters. Photograph courtesy of University of Nevada Cooperative Extension. The wildfire threat to Nevada communities is significant and increasing, with 768 wildfires burning 1,329,289 acres in 2017. Key to reducing this threat is an aware and proactive public who implement the necessary pre-fire activities – actions that improve house survivability during wildfire. In Nevada, homeowners, firefighting organizations, elected officials, schools, Cooperative Extension, landscape management professionals, community leaders and others all play a role in promoting wildfire awareness and assisting in the adoption of pre-fire activities. 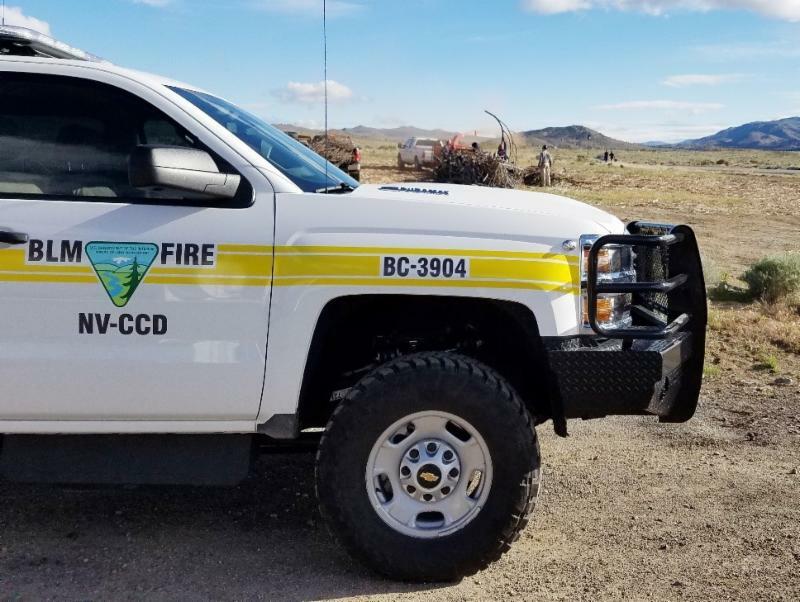 The Living With Fire Program established the collaborative Nevada Wildfire Awareness Week/Month as a means to expand the education program and launch a coordinated, statewide wildfire awareness campaign each year. This May, Extension once again worked with federal, state and local fire services; public safety agencies; community organizations; and others to participate in Nevada Wildfire Awareness Month. This year’s theme was “Prepare Now! Wildfire Knows No Season” to encourage Nevada communities to prepare their homes and families for wildfire throughout the year. 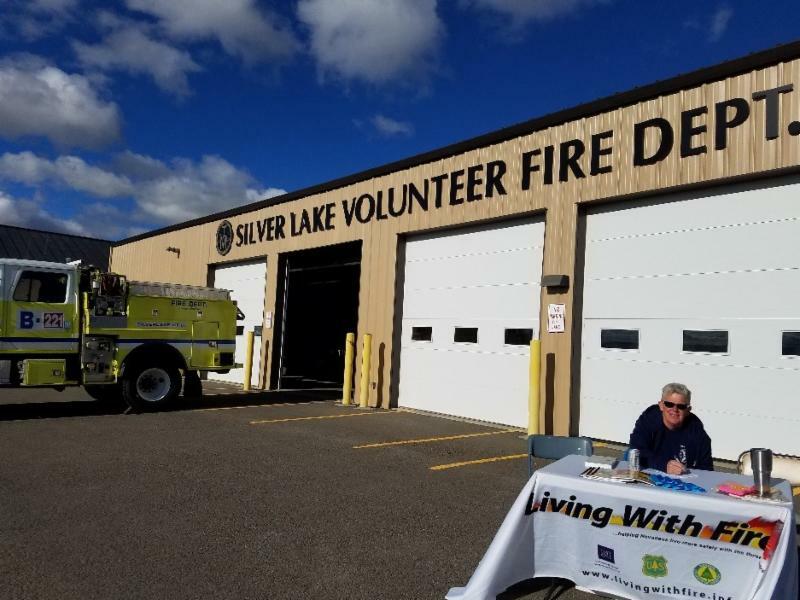 The month featured several events statewide to educate and assist homeowners in making their homes safer from the threat of wildfire. 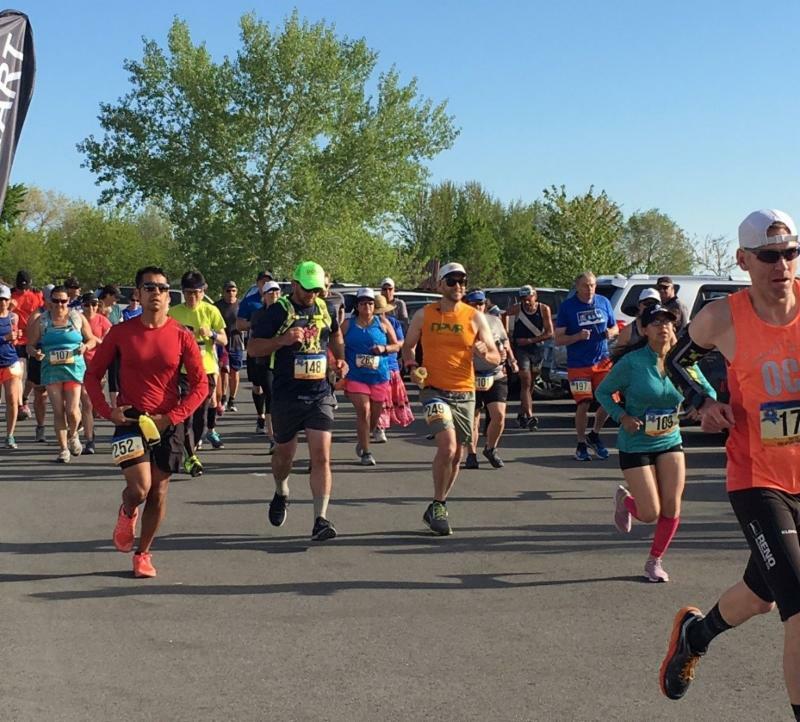 The annual Battle Born Trail Series: Fire Up for Firefighters Multi-Hour Event was an organized run held in Reno. The run had 176 runners. In addition to providing education, it raised $5,823.40 to benefit Nevada fallen firefighters’ families and local firefighters injured in the line of duty via the Nevada Local Assistance State Team Program. University of Nevada Cooperative Extension’s Nevada Radon Education Program and Nevada Supplemental Nutrition Assistance Program Education, along with the Living With Fire Program’s federal, state and local firefighting entities helped support the event. ﻿station. Photograph courtesy of University of Nevada Cooperative Extension. station. Photograph courtesy of University of Nevada Cooperative Extension. At the Junk the Junipers events on May 12, residents from 310 households removed 374 truckloads of highly flammable plants, such as junipers, that were close to their homes and brought them to specified locations in Silver Lake and Washoe Valley in northern Nevada to be chipped for use as mulch. Several other events used The Ember House, a bean-bag-toss game, and the Juniper Toss, a game where participants throw fake juniper trees into a trashcan, to educate children and their parents on wildfire awareness. Nevada Wildfire Awareness Month began as a weeklong statewide effort in 2005 and expanded in 2014 to the entire month of May. Major funding partners include the Bureau of Land Management; U.S. Forest Service; Nevada Division of Forestry; and the Sierra Front Wildfire Cooperators, with additional support from federal, state and local fire services; public safety agencies; community organizations; and others. 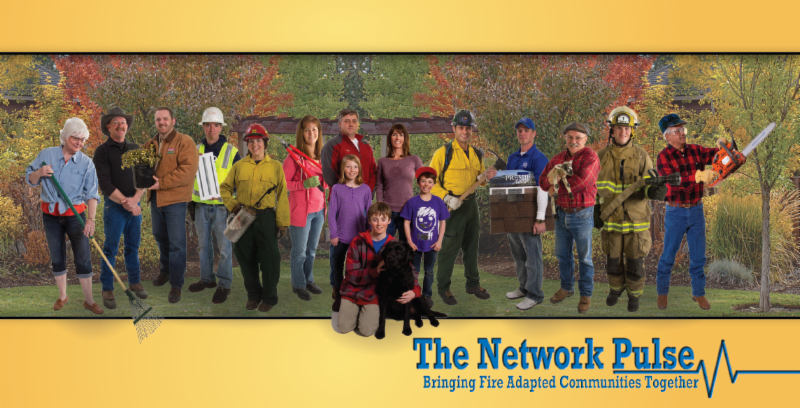 The newsletter will transition to the new Network Coordinator, Michael Beaudoin. Be sure to add Michael’s email, mbeaudoin@forestry.nv.gov so The Network Pulse isn’t sent to your spam folder. Be on the lookout for next month’s Network Pulse!